I’m going to try filter off a few from each batch of stock images to be exclusive at DT and FT and have another bunch of files that will just be uploaded everywhere as they usually would be. So as long as some images that I submit get through the inspection process it should be much better than going exclusive-only to just one stock site and limiting distribution of my images at differing price points and credit structures. The Exclusive info on FT says the following: (I’m currently at Bronze level) (there is a bit of the following tables cropped off in the page, sorry about that, but the main info is still there). Royalties rely more on the actual image sales and the level of a particular image, so this doesn’t sound as good an option as FT… An interesting experiment all the same. Fotolia is always going to be my best referral site with its earnings equal to that of my image sales. Dreamstime is a slow burner with referrals but can come up trumps now and again when a referral buys a credits package. On another note, I’m pretty much decided that I will no longer upload new images to BSP or CSP as their earnings are tiny and payouts infrequent, I’ll leave my images online all the same. No point wasting the time it takes to upload and categorise my images. 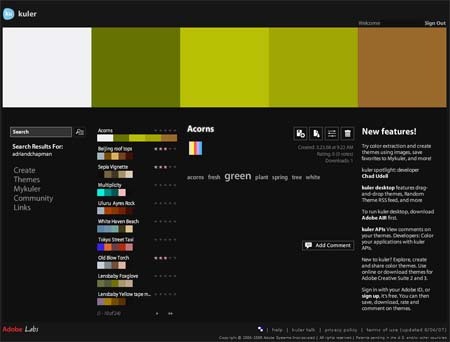 I’ve been playing with colour swatches for a while off and on, but recently I’ve been comparing Adobe’s Kuler and the ColourLOVERS site. Kuler is a pretty cool interface and seems to pick the better colours from an uploaded image first crack. 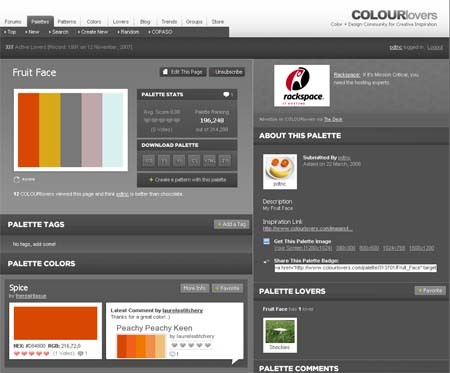 ColourLOVERS is a fun little site with some cool features that let you save your swatches in different formats for use in different software, a feature that Adobe’s Kuler lacks.